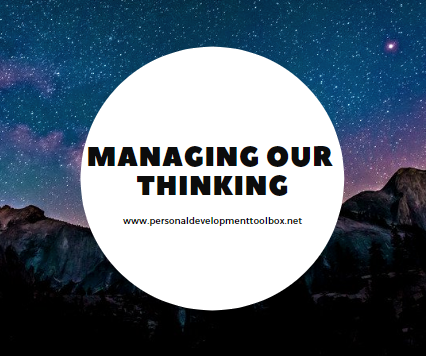 Managing our thougths is one of the most useful skills we can develop and one of the best uses of our time. My belief is that our beliefs lead to our thoughts, our thoughts lead to our habits and actions, and that our habits and actions lead to our results. I put my beliefs on paper to be able to better examine what I do and to evaluate myself to see if my actions are congruent with my beliefs. Following are some of my core beliefs about managing my thoughts. I encourage you to make your own list. There are four aspects to anything that we do, physical, mental, emotional, and spiritual. In this case, I am not necessarily referring to the spiritual in the sense of religious spirituality, although for many it is. My reference is to the sense of being aligned with something greater than ourselves. Those four areas are dependent and interrelated. In order for an individual to work towared achieving his or her full potential, each area must be developed fully and in harmony with the other three. That is one part of living a blanced life. Managing the mental aspect directly impacts the other three areas because the thoughts that we think and allow to enter into our mind influence our physical energy, our emotional equilibrium, and our willingness to surrender ourselves to and become a part of the group. Mental focus allows us to keep our thoughts focused on working towards achieving our potential in the other three areas. The way to make a team more mentally tough is to improve the mental toughness of the individual players. Developing individual mental toughness leads to collective team improvement. It takes strong leadership, patience, and a plan for a coach to develop mental toughness in his/her team. Players are going to be at different levels of mental toughness, and some will never get to where you want them to be. In addition to a team plan for mental toughness, we must have individualized plans for each player to reach his potential. Discussions about toughness with the entire team does make a difference with individual players, but I believe that we are more successful by thinking and approaching the development of mental toughness for each individual rather than only focusing on the team as a whole. Almost anyone can be as mentally tough as he or she wants to be. Not everyone can be a great player, but anyone who is a competitive athlete can make a commitment and then stick to that pledge to become more mentally tough. Becoming mentally tough is a matter of making up your mind that you are going to be tough, sticking with your decision, and not letting others influence you or keep you from being tough. It is easy to make a commitment to make mental toughness a habit or personal trait, but it is very tough to stay on track and truly be mentally tough. Like anything else, there will be times when the journey toward toughness is one step up and two steps back. But, because I truly believe in the importance of mental toughness for the success of a basketball team, and for the present and future life success of the individuals involved, I believe it is worth the time, the investment, and staying strong and supporting them during their bumps in the road. Mental toughness is a habit and will take as long as, if not longer than, any other habit to build. It takes a minimum of 21 days to develop a habit. It has been my experience that visible signs of improvement in the area of mental toughness take quite a bit longer than that. Unfortunately, young people see more examples of not being mentally tough than they do examples of others who are mentally tough. Trash talking, excessive celebrating, complaining to officials, and blaming others are just a few of the examples that our players frequently see of a lack of toughness. Much of our society does not understand what mental toughness is, nor are those actions viewed as a lack of toughness. Quite often, a coach will be one of the few positive influences for mental toughness in the life of a player, which contributes to the length of time it takes to improve mental toughness. Mental toughness must be taught and emphasized daily. I don’t mean that there needs to be a big speech every day about mental toughness, but the cornerstones and expectations for mental toughness must be there every day of the season regardless of whether it is a practice or a game. The components of and the outward manifestations of mental toughness such as concentration, poise, unwavering confidence in oneself and one’s teammates, rituals, consistency of effort, and positive body language can all be observed in every meeting, every drill, every possession, and every huddle. To emphasize mental toughness, someone on the coaching staff must be focused on observing those areas. If the head coach is focused on execution sometimes some of those cues can escape her. If that is the case, it is crucial to have another coach who is looking for, praising, and correcting the subtle indicators of where your players are in terms of mental toughness. Style of play and personality of the coach have no bearing on the need for mental toughness, or for whether or not a team displays toughness. For whatever reason, teams that play more of a half court type of game seem to develop the reputation as being mentally tough. Choosing, or more accurately, being dictated a certain style of play by your personnel, is not going to have any impact on the level of mental toughness of your players. You can play as fast or as slow as you want, play any style of offense and defense and the schemes themselves are not going to make any impact on the level of mental toughness of your players. The only way to impact your players is to make it a point of emphasis for your program. Another misconception is that you have to be a loud and demonstrative coach for your players to be mentally tough. One example in recent history of a coach whose age and demeanor would seem to preclude him from being Mentally Tough is Butler’s Brad Stevens. He is very intense, but not overly demonstrative on the sidelines, and the Butler players have consistently demonstrated mental toughness at the highest levels of competition. There is a difference between having a positive mental attitude and mental toughness. Being a positive, upbeat person is not the same as being mentally tough. Those traits can coexist within an individual; however, mental toughness is not only the ability to stay enthusiastic when things are not going the way you want, but it is also the strength to make yourself better and perform under pressure. Make sure to not take it for granted that players who are positive people are mentally tough as well. Work to develop the mental toughness of those players. The coach must be the most mentally tough person on the team. The players will reflect the coach in the area of mental toughness, maybe more than in any other area. That is why I constantly work at and evaluate my own mental toughness in addition to that of the assistant coaches and players in our program. The coach should face more pressure than anyone else on the team. Depending upon the level you coach, there are self imposed pressures, pressure to win, pressure from boosters, pressure from parents, pressure to make strategic decisions, and pressure to balance your life… The list of pressures a coach faces seems endless. Everyone must make a conscious effort to work on and improve his or her mental toughness daily. Every player has a role and pressures that are unique to their position on the team—all the way from the All American player who is counted on to make the game deciding plays from the opening tip to the final buzzer, to the player who usually does not see action, but is expected to work hard every single day at practice without much personal reward. A player seemingly at the top of his game has to continue to become mentally tougher because of the challenge of continuing to produce and the pressure that comes with that. Winning teams and losing teams both need mental toughness, they just need it in different ways and to deal with the different pressures that come with their situation. The state of body and mind that we want for our players is calm on the inside and energized and alert on the outside. That is a difficult state to get to, but that should be the goal of our preparation and practice that we put our players through. Developing mental toughness helps a player to be able to calm his mind, which will allow him to be more alert and energized outwardly. Adversity is one of the key builders and tests of mental toughness. Mental toughness develops in part by being forced to use the skills that go into making mental toughness. Like most things that we undertake, we are not as good at overcoming difficult circumstances the first time that we encounter them. So, one of the positives that can come out of any adversity is the opportunity to build more mental toughness. In order to maximize your mental toughness, you have to experience and be able to overcome a series of adversities. The truly mentally tough individual rises to the top when things are not going well. Anyone can appear to be tough when things are going well, but, in my opinion, the true test of mental toughness is how an individual responds during adversity.